You are currently browsing the category archive for the ‘Apps’ category. Yes, it’s been a while since iWork apps got updated and everybody must have noticed this: Mail-merge is gone. But well, telling me why doesn’t help me get things done. The only workaround so far (if you wanna stick with Pages and Numbers) is to get Pages ’09 and Numbers ’09. And even with the ’09 version, I found that Pages could only pull in the FIRST column of the FIRST sheet in a Numbers ’09 file. So, it’s basically dead. Whoever is responsible for removing mail-merge is crazily stupid. Calendar – I use a Mac. It syncs really well across my iMac, iPad and iPhone. 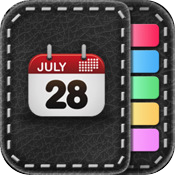 Reminders – I’ve got tons of to-do apps but eventually I’m using Reminders. Simple and syncs well and …Siri integration on iPhone. BibleReader (universal)- A Bible app that I’ve been using since Palm era. The NIV Bundle that I bought almost 10 years ago is now working on my Mac, iPhone and iPad. Notes and highlights can be synced across platform. The best Bible app so far. In-app purchases work on all platforms as well. I’ve bought Bible dictionaries and various commentaries already. I like the split screen option that allows me to pull up both NIV and Expository Commentary at the same time. The way it shows up linked scripture is unobtrusive and intuitive. Really helps in studying the Bible. It actually makes me want to read the Bible more often. MobileRSS – I like the iPad version more but it’s easier to read on iPhone on a crowded train. GoodReader – This app just gets better and better. I really regret having bought iAnnotate like two days before GoodReader enhanced their annotation UI and tabbed view (=_=!). The ability to add two different DropBox accounts and various FTPs is really helpful. It also allows you to edit TEXT files. It supports a WIDE range of file formats as well. Facebook – Well, what else can you do with Facebook other than… Facebook-ing? Clock – I do use the clock to set alarms. Phone and Messages – I do use Messages a lot more after iMessage is activated. Camera+ – Extremely useful camera app. Nice filters with good integration with Facebook and Twitter. MoneyWell – I use MoneyWell on Mac to keep track of my expenditure and income. They sync through DropBox. ForScore – Indispensable app for musicians and music teachers. I’ve put MANY scores (in PDF) in this app (1.1GB now) but it rarely crashes. It has half-page turns which is really useful. It also allows you to annotate the score with musical signs and high-lighters. It also provides a way to mark DC, DS, repeats, and Coda so that you can jump to where you need to by one tap. US$4.99 well spent. 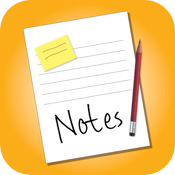 Noteshelf – Best note-taking app I’ve tried so far. I’ve bought TONS of note-taking apps (I’ve even written a detailed review on all these apps) but this is the app that I use most frequently. It takes hand-written notes and, with the latest update, typed notes as well. Images can be imported into the app for annotation. Notes can be exported as image or PDF. Export options include Email, Dropbox, and Evernote. BTW, the UI is really beautiful yet with no compromise whatsoever on functionality. US$4.99 well spent again. PlainText – A nice universal FREE app for simple note-taking. Integrated with DropBox. Clean UI made just right. iBooks – I guess it’s because I never really bought books from Amazon so iBooks is the app I turn to when I read ebooks. And I do buy ebooks from iBookStore. I don’t read PDF on iBooks, though. I use GoodReader instead. Japanese – A well-built Japanese dictionary, phrase book, and study tool app. Dictionaries – Oxford Music Dictionary, Merriam-Webster Dictionary, Cambridge Dictionary…etc. I usually buy dictionaries when they are free (Oxford Music Dictionary is probably the only one that I actually paid for). Besides, now we have built-in dictionary on iPhone and iPad (select word > define). I have a couple French and German dictionaries as well. Genius Scan – Best scan app I’ve tried so far. Excellent B/W rendering. Creates clean and crisp PDF / JPEG images. Skitch – Great Free app for quick annotation on pictures / maps / web clips. [UPDATE 2: If you haven’t bought any note-taking app yet and you’re looking for a REALLY powerful one. 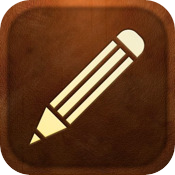 Check this out: Notebook for iPad by Circus Ponies. Pretty expensive with a price tag of US$29.99 but if you’re a professional e.g. a lawyer, a lecturer, or if you’re a college student/grad-school student looking for a serious note-taking app. This could be just perfect for you. I haven’t bought it yet (I was thrilled to see Circus Ponies announcing its release on FB until I saw the price tag…!) so I can’t testify whether it works as it says. But if it works as it says, it’d mean it has everything all other apps offer combined: formatted note (with fonts, font colors and sizes, plus expandable hierarchical outline), diagram with shapes and lines/arrows, insert PDF into notebook and annotate, search in notes (the search function on Mac is really robust: imagine having an index page you normally find at the back of a textbook but with even more powerful and detailed keywords), and scribble (since I haven’t bought it, I can’t tell whether it’s good for handwriting). I’m now writing to the devs to ask about how files are exported from iPad. This should be crucial to non-Mac users in particular.] <– UPDATE 3: I’ve kept a really close eye on the reviews in App Store since the day it hit the shelf and I have to say that it’s a bit disappointing to see that the comments are mostly negative. It seems that functions are there but the execution sounds pretty flawed. I guess it’s mainly due to the limited RAM and CPU power of the current iPad (though obviously the developers need to review the UI as well). Most people complained about sluggishness and crash. These are actually mostly due to memory shortage of the device than to flawed codes. Anyways, US$29.99 is just too much. Think about this: Pages is only US$9.99. So I don’t see myself buying it any time soon. I’ve lost count of how much I have spent in AppStore. In fact, I don’t want to keep track of it coz I know the number would be a bit horrifying – I’ve bought too many. Some people think it’d be nice to get a trial period. Well, it’s true but then at the same time, I think, it’s just like dining in a restaurant. You go visit a restaurant because you’ve read some nice reviews along with some bad reviews and you wanna see it yourself. You go in; you sit down; you make your orders and you taste the food. It only tastes so so or, maybe, it tastes awful. Do you just leave the restaurant without paying? Or do you pay and swear you’ll never go there again? Bought this app when it was on sale at US$0.99! Too bad that it’s back to US$5.99 now but this app is very often on sale – sometimes 1.99. metimes 2.99. Go over to Appshopper and you’ll see how often it goes on sale. Put it on your wish list and wait! I use this app mainly for my Japanese lessons. The developer(s) is very responsive. I wrote to him about a minor bug and he replied within hours. As I said in point 1: DropBox! It now integrates with Google Docs but it’s not a sync. You can upload the file but it’s not syncing, which means the different versions of your file will become different files in Google Docs. Having Evernote integration will also be nice because with Evernote, handwritten notes in PDF can become searchable (on Mac/PC, not on iPad/iPhone). This can be really helpful. Some other people want to be able to import PDF but I can do whatever I want to my PDF files with GoodReader and iAnnotate already. So I don’t really care about PDF. Apart from handwriting, you can also add pictures from photo library and draw on it. There are also stamps (emoticons-like) available. 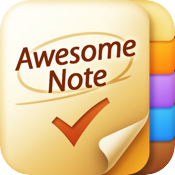 I now usually write lesson notes in this app and email it the note to my students after lesson. With almost all of my music books on iPad (btw, I use forScore, US$4.99, great app for musicians, praise team leaders etc), I can literally go paper-less. It has only one single book cover and a few templates such as ruled and plain paper – makes it really hard to find your desired notebook as you gradually build your library. No thumbnail of pages provided. You have to flip through the notebook to find the page you want. One Pro though: it supports VGA out now. But since I don’t have the app, can’t test how the VGA out works. Some so-called VGA-out-supported apps do a poor job on it. May ask my friend to test it. Hmm…well… maybe one more pro: it’s one three bucks cheaper than Noteshelf (but with much fewer functions…). This runs tie with Awesome Note for one reason: it’s free. The more I use this app, the more I like it. This app goes to the opposite of Awesome Note that there’s nothing graphic in it. Just as the app title, PlainText, says, it is plaintext only. Why place it 2nd on my list then? It supports multi-layered folders (and the folders will sync to Dropbox). 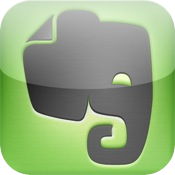 I like this one more than Evernote, though both are free. If you’ve ever tried to export notes from Evernote, you’d notice that it only exports as html or Evernote’s propriety .enex format – neither is good for further edit in other apps/softwares. Of course, you may copy and paste but there’s no simple way to do it if you want to get the content of a whole set of notes from Evernote to, say, MS Word or Apple Pages. PlainText being plaintext means basically all text-editing software, may it be as simple as Text Editor or as professional as MS Word or Apple Pages, can read and edit the notes you’ve made. Got a feedback forum and the developers do listen to users’ feedbacks and requests. From what I read on forum, some much requested features are now under-review by the developers (which means update is coming). These requests include syncing with iCal and Gcal, connecting with blogs like WP, tabular notes, UI enhancements…etc. I can’t wait for the next update. I used to use this almost daily but stopped doing so after getting the iPad coz there’s no iPad native app. Blowing up the iPhone app on iPad doesn’t work for Momo coz it’s mostly text and those wriggling lines were really killing me. So I switched to other note-taking apps. But now that it’s universal, I am definitely coming back to Momo. I’ll come back to this app more often. It syncs with Google Docs and Evernotes. And since it syncs with Evernote, you can add tags to notes after syncing them to Evernote. You can add image or map to a note but there’s no formatting supported in notes. 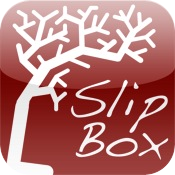 Seriously, if you have iPhone only, this is a really good app. It doesn’t stay in top 10 paid apps in AppStore for no reason. My biggest gripe is there’s no iPad version and the developer has made it quite clearly that the iPad version will be a separate app, which means I’ll have to pay again if I want to get it over on iPad. Though I understand it involves a lot of work to port the whole GUI over to iPad, I don’t wanna pay again. Say I’m cheap… I admit it. 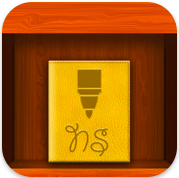 This app is developed by the same developer who created Noteshelf (see no. 1 above). It can import PDF and allows annotation but not without flaws. The annotation is saved as embedded image in PDF and so there’s no way to modify the annotations on PC/Mac/another app. I think the cheapest PDF annotation app that works is GoodReader. First thing first, I HATE this icon. This icon simply looks cheap. 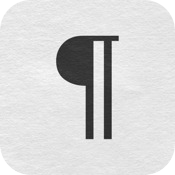 I simply don’t wanna let this icon sit on the home page. As for functions, just as the icon suggests, it supports handwritten note, voice recording, video and images. It also supports to-do. The problem is each note can only make use of one function…except for image – you can draw on image, but other than that, text note is text only, to-do is to-do only… So it’s all in one app but not in one note. I have to admit that I’ve abandoned this app for a while after having tried it and failed to like it. But I notice that there’s a recent update that has added cloud support (dropbox, maybe? I have to check. UPDATE: I can’t figure out how that cloud support works. I’ve got iDisk, Dropbox and Evernote. I’ve got these three work in other apps like GoodReader, PlainText, SlipBox, NoteShelf, QuickOffice… but just can’t figure out how to get “cloud support" in Notes n More. And as a result, I have deleted it from my iPad already. So, to be fair, no star scoring for this one. You can go over to its website and have a look at the introduction video. This one is hard to decide. 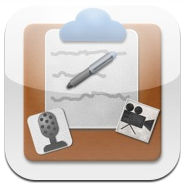 The Mac app is great – supports formatted notes, image, voice etc. But I find it hard to like the iPhone/iPad app. One thing is there’s no way to view notes offline on iPad. On iPhone? Only ‘Favorite’ notes are usable offline. The iPhone/iPad app does not support formatted notes either though it supports image and voice. But then, the free version allows 40mb of traffic capacity per month. Now if you take text notes only, 40mb is a lot; but if you make voice notes a lot, 40mb isn’t much. I’ve tried to force myself to use it (cuz it’s free) but I really don’t like it that much (see above under PlainText) – just personal preference. You may like it, though. Go give it a try. It’s free after all. And if it turns out you like it a lot, you probably don’t mind paying US$5/month to go premium. This is an odd one. I use this almost solely for taking Bible-related notes. It’s intended for people with a huge collection of notes. It has a robust tag and search function to help you locate the idea you need. It can work with its Mac app (free), which works with BibDesk, Bookends (programs to manage references), Skim (a PDF reader and annotation tool) and Graphviz (a graph visualisation tool) – perfect for researchers. I’m not a researcher but reading the Bible actually is very similar to being a researcher. The app works with Dropbox and also supports iTunes file transfer. At US$4.99, it’s ok to just buy it for trying out. But now it’s US$9.99 – a bit steep, I’d say. But if you use a Mac and you’re studying/doing research, it’s worth it to go over to its website and have a look.